Computers, the internet, email and cell phones continue to change the way the world works, plays and communicates. Computer usage, a key marker of technological progress, has increased significantly in the past five years in 26 of the 35 countries where comparative data is available. In addition, more people now have access to email and the internet – and large numbers report they are taking advantage of these high-tech tools at home or at work. However, while computer usage has increased significantly in a many countries, particularly in Europe, it is growing relatively slowly, if at all, in parts of Asia, Africa and Latin America. And many less-developed nations continue to lag behind the West and the developed countries of Asia in terms of computer ownership, internet access and email usage. However, publics in both the developed and developing world are acquiring cell phones at a staggering rate; majorities of residents in 37 of the 47 countries surveyed now own a cell phone, including 98% of Czechs and Kuwaitis, and 97% of South Koreans, as well as two-thirds of Nigerians (67%) and residents of Ivory Coast (66%). While large differences persist in the overall rate of cell phone ownership in the rich and poor nations, this gap appears to be narrowing rapidly. Although the use of computers has increased in many poor and middle income countries over the last five years, a global digital divide remains, with computer usage more common in wealthier countries. 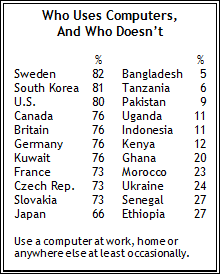 Overall, majorities in 16 of 47 countries say they use a computer at least occasionally at work, school, at home, or somewhere else. Computer usage is particularly widespread in the United States, Canada and Western Europe. For example, roughly eight-in-ten Swedes (82%) and Americans (80%) use computers. And even though computers were relatively prevalent in the these countries five years ago, usage rates have nonetheless increased significantly in Great Britain (+ 17 percentage points), Germany (+13 points) and France (+13). However, computer use is not so widespread in all Western countries; just 55% in Spain and 41% in Italy say they use computers at least occasionally. Computer usage has grown substantially since 2002 in Eastern Europe, particularly among Slovaks (+21) and Bulgarians (+19). Still, there are large differences among countries in the region. Computer use is widespread in Czech Republic and Slovakia (73% each), but relatively limited in Ukraine (24%) and Russia (36%). Similarly, access to computers in the Middle East varies widely. While most Kuwaitis (76%), Israelis (65%), Lebanese (61%) and Palestinians (56%) use computers, fewer than one-in-three do so in Turkey (29%), Egypt (28%) or Morocco (23%). But the biggest differences among countries exist in Asia. While computer usage is high in South Korea (81%) and Japan (66%), it is quite low in Indonesia (11%) and Pakistan (9%). And at 5%, Bangladesh ranks last among the 47 countries included in the survey. Venezuela is the only Latin American nation where a majority (53%) reports using a computer on at least an occasional basis, but usage has increased significantly over the last five years in Bolivia (+15) and Peru (+13). And with a 22-point increase since 2002, Brazil has enjoyed the largest increase of any country included on the survey. No African nation has a majority of regular computer users, and the number of users is particularly low in Kenya (12%), Uganda (11%) and Tanzania (6%). However, considerably more Nigerians are using a computer today than five years ago (37% today, 23% in 2002). Majorities in 16 out of the 47 countries surveyed in 2007 say they own computers, and in some countries it is now difficult to find someone who doesn’t own one: 93% of South Koreans, 84% of Kuwaitis and 81% of Swedes say they have a computer. Computer ownership is relatively common in the developed countries of the West and Asia, less widespread in the Middle East, and comparatively rare throughout much of Latin America and Africa. Striking contrasts in computer ownership exist within most regions of the world. For example, Asia is home to the country with the highest ownership rate – South Korea (93%) – and the country tied for the lowest – Bangladesh (2%). In Latin America, 43% of Venezuelans own computers, compared with 17% in Peru. More than two-thirds of Slovaks (68%) own a computer, more than twice the proportion as in nearby Russia (30%). In the Middle East, large majorities in Kuwait (84%), Israel (77%), Lebanon (55%) and the Palestinian territories (58%) own computers, compared with just 11% of Moroccans and 18% of Egyptians. In Africa, where computers are particularly rare, ownership rates range from 2% in Uganda and Tanzania to 27% in South Africa. Overall, computer ownership has risen in 32 of the 34 countries where 2002 data is available. The increase has been particularly striking in countries of the former Eastern bloc, where progress on many fronts was stifled under communist rule. Computer ownership in Slovakia is up 28 percentage points in the past five years, the largest increase of any country surveyed. The proportion of computer owners in Russia has more than quadrupled from 7% to 30% since 2002, while in Bulgaria it has more than tripled, to 29%. While computer ownership in Eastern Europe and in many other countries has increased significantly, the gap between technological “haves” and “have-nots” generally is growing in the countries where trend data is available. Countries where rates of computer ownership were the lowest in 2002 remain at the bottom of the list today. For example, there has been no growth in the proportion of adults who own computers in Bangladesh, as well as in Tanzania and Ivory Coast. Elsewhere in Africa, the proportion of computer owners has increased by only one percentage point in Uganda (from 1% to 2%) and by two points in Kenya (1% to 3%). In contrast, computer ownership is increasingly common in the West, even in countries where most adults owned a computer five years ago. Growth has been particularly strong in France (+21 percentage points) and Great Britain (+18 points). In both countries, nearly three-quarters of all adults now own computers (73% in each), about equal to the ownership rate in the United States, where 76% of all adults own a computer, up six points in the past five years. In many developing countries, people are much more likely to use computers than to own them. For instance, in Ivory Coast and Mali only 6% say they own a computer, but in both countries about four-in-ten say they use a computer at least occasionally at work, school, at home, or somewhere else (41% and 38%, respectively). The same pattern holds true for much of Africa: in Senegal (27% use/5% own), Nigeria (37% use/16% own), Ethiopia (27% use/7% own), Ghana (20% use/6% own), there are substantial differences between the percentage of the population saying they own a computer, and the proportion using one. But this gap is present in other regions as well. Peruvians are more than twice as likely to use a computer (39%) than to own one (17%). And while most Czechs own a computer (63%), they are even more likely to report using one (73%). Usage of the internet and email predictably mirrors computer usage. Internet and email use are generally greatest in countries where significant proportions of the population use computers. For example, Sweden, South Korea, and the United States are the top three countries for both computer and internet usage. About eight-in-ten South Koreans (80%), Swedes (79%) and Americans (78%) go online at least occasionally. In contrast, internet users are rare in Bangladesh (2%), Tanzania (5%), Pakistan (6%), Indonesia (7%) and Uganda (9%), countries that rank at or near the bottom in terms of computer usage. Sweden leads the world in use of email, with 74% of Swedes saying they send and receive messages online, narrowly ahead of the U.S. (72%), Canada (72%) and Great Britain (68%). Notably absent from the top of the list of most frequent emailers is South Korea, the country that leads the world in computer ownership and internet usage, and ranks second for computer usage. While South Koreans may love to go online, disproportionately fewer (57%) report they use email at least occasionally – fully 36 percentage points below the proportion in South Korea who own computers, 24 points less than the percentage who use computers, and 23 points less than the share that go online – easily the biggest disparity between ownership rates, internet usage and email rates of any country in the study. In contrast, 80% of Americans use computers, and 72% say they at least occasionally send or receive email, while in Japan, 66% use computers and 64% use email. Not unexpectedly, email usage tends to be low in the African countries where few own computers or go online: Tanzania (4%), Uganda (8%) and Kenya (11%). The proportion of adults who own a cell phone has surged in the past five years. Since 2002, the median increase in cell phone ownership is 24 percentage points – nearly five points a year. Overall, cell phone ownership increased in every country except Italy, where it remained unchanged at 79%. As with computer ownership, the increase in cell phone owners is particularly striking in the formerly communist countries of Eastern Europe. In Russia, about two-thirds (65%) own a cell phone today, compared with only 8% five years ago, an increase of 57 percentage points and the largest gain of any country in the study. Ownership levels also soared in the Ukraine (+47 points), Bulgaria (+38 points), Slovakia (+35 points) and Poland (+33 points). Overall, five of the biggest increases in cell phone ownership occurred in Eastern Europe, with Nigeria (+56 points), India (+48), Argentina (+35), Tanzania (+32%), Bolivia (+32) and Ivory Coast (+32) also recording large gains. Unlike computers, the recent growth in cell phone ownership is widely distributed across the developed and developing worlds. In fact, some of the less affluent countries have recorded some of the largest gains, a trend likely fueled at least in part by the unreliable landline telephone service available in many developing countries. 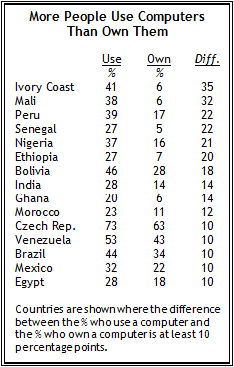 In Ivory Coast, for example, cell phone ownership rose 32 percentage points to 66%, while in Nigeria, the gain was even larger: 56 points, to 67%. These gains in the poorest countries have helped shrink the “cell phone gap” between the developed and the developing world. Still, a significant ownership gap remains between the have and have-not countries of the world. The countries with the lowest rates of cell phone ownership included some of the poorest nations in the world – Indonesia, where barely one-quarter (27%) own a cell phone, as well as in Uganda (29%), Ghana (34%) Pakistan (34%) and Kenya (33%) – while the leaders generally are countries with mature or fast-growing economies in Europe and Asia, including the Czech Republic (98%), South Korea (97%), Slovakia (94%) and Japan (86%).